By Ben Crisman, Alejandro Feged, Mike Findley, Oliver Kaplan, Kristina Kempkey, Paul Kuhne, Billy Matthias, and Joe Young. 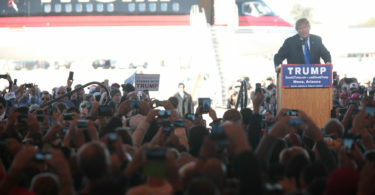 Composite photo provided by Oliver Kaplan. 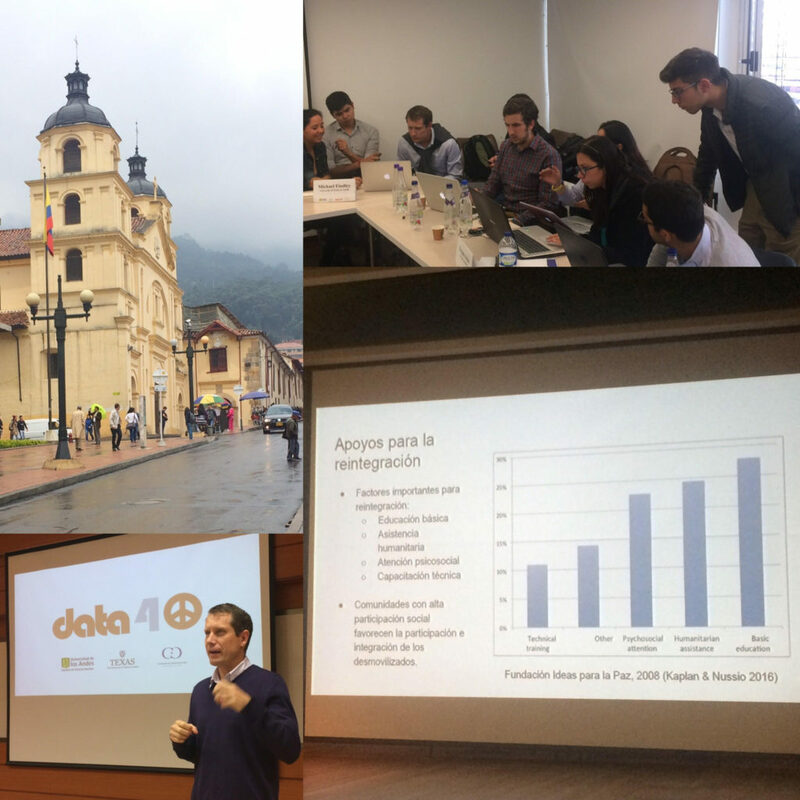 This post is part of a series describing the Data4Peace “hackathon” that was held at the Universidad de los Andes in Bogotá, Colombia, from May 10-12, 2017. Shortly after the Colombian legislature approved the peace deal with the FARC rebel group in December 2016, the critical yet arduous process of demobilization began. Nearly 7,000 FARC members have laid down their arms so far, and additional non-uniformed militia members are joining them. Since the process was to be completed within the short timeframe of 180 days, it became a priority issue for the Data4Peace hackathon (and is the first section of the full report). So how exactly can one “hack” Disarmament, Demobilization and Reintegration (DDR) policy to provide rapid and useful analysis and recommendations? The approved peace deal established that the FARC would demobilize within 19 Zonas Veredales Transitorias de Normalización (ZVTN) and 7 special zones in 25 municipalities across the country. Our Data4Peace DDR working group focused on identifying policy recommendations for municipal officials. Together, the academics, policymakers and politicians identified four main concerns for deeper analysis: the management of the ZVTNs, limited economic capacity to absorb demobilized FARC fighters, a lack of rural reform, and the inequities in resources channeled to the demobilization zones relative to their host municipalities. With these concerns in mind, the team focused on three core research questions: What economic capacities do ZVTN municipalities have to absorb demobilized fighters? What are best practices to create employment for recently demobilized fighters? And what factors contribute to recidivism among former fighters? 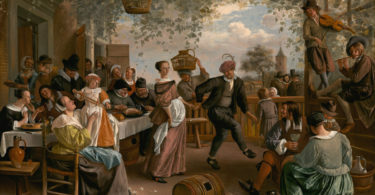 Employing a combination of brainstorming and data analysis and visualization, the participants broke into teams and analyzed these questions in just 48 hours. In the case of individual recidivism, we encountered survey results illustrating that ex-combatants most value education, humanitarian assistance payments, and psychosocial support for facilitating their reintegration. For dissidence at the group level, the team analyzed how the demobilization of paramilitaries contributed to later violence by criminal bands, or BACRIM, which serves as a possible cautionary analogy for the post-FARC demobilization period. Joe Young of American University and Ben Crisman of Princeton University created a predictive model to identify a municipality’s ability to provide services to their constituents. They modeled expected infant mortality (based on social and economic factors) and then compared those results to actual infant mortality rates. 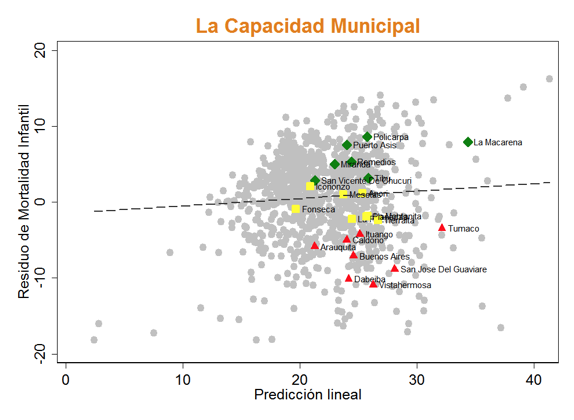 They then visualized which municipalities underperform (the red colored municipalities in Figure 1) when providing services and could thus fall behind in their commitments to reintegrate fighters. They also plotted the economic distribution of these municipalities compared to the national average to identify low-capacity outliers. 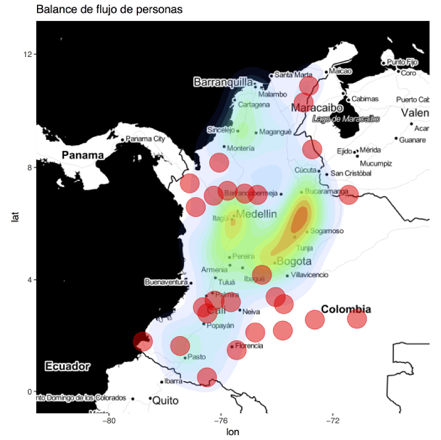 A map generated by Alejandro Feged (Universidad del Rosario) illustrates the patterns of population migration among Colombian municipalities (Figure 2; a gradient of movement from blue to red zones), which projects a de-population of ZVTN regions (red dots) and associated development challenges. The DDR team was also able to qualitatively examine attitudes of residents of ZVTN municipalities about FARC members reintegrating into their communities by using data from a report from the Colombian polling company, Cifras y Conceptos. Encouragingly, these residents generally reported that collective reparations programs for victims had advanced further than in other parts of the country. However, more troubling, they also expressed lower levels of interest in reconciliation as measured in a variety of ways. Address Recidivism: The government should increase security in ZVTN areas as ex-combatants may enter those zones. It should also focus programming on education, family support, and civic engagement among receptor communities. Support ZVTNs and their Host Municipalities: As municipalities with ZVTNs will likely experience an influx of former combatants, the government should provide financial transfers to meet economic needs while prioritizing support to the low-capacity municipalities of the group. Reconciliation Programs in Post-Conflict Municipalities: Municipalities should introduce reconciliation programs to manage social conflicts. Economic Reintegration: The government should provide employment assistance to individuals with greater needs, including focusing programs on former youth combatants who may be marginalized. Even in just a few days, the hackathon was able to provide new insights to inform the ongoing DDR process in Colombia. We will continue to analyze the FARC reintegration as it unfolds.